Review: Some of us will probably still remember that awesome gritty Hong Kong cinema from the 80s and 90s. Fate deals the antiheroes a really bad hand and when you think things can't possibly get any worse everything goes to hell. 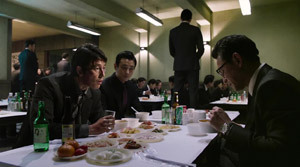 "Asura" is a South Korean crime movie which sticks absolutely to this formula and at times gets across as even grittier than we remember those movies. In terms of moral there are merely different shades of black to be found here, heroes you will look for to no avail and yet there is an individual that works quite well as an antihero, if you can deal with this kind of hero... Because even if you need at least just a little bit brighter shades of grey in a movie to get emotionally attached to anyone you surely have come to the wrong place. And even though a lot could have gone wrong considering the lack of characters we can root for the movie still remains thrilling until the end. To be honest, I was somewhat surprised that I felt outright unpleasant during some moments. The depicted world, which plays in the fictitious city Annam, is almost too nihilistic and hostile. Every other minute there is some sort of betrayal, but even that isn't right, because for betrayal there first needs to be some kind of trust. But trust is nowhere to be found in Annam. Here, everything revolves around money, power and selfishness. That latter one is closely connected to a good portion of brown-nosing as well should be self-explanatory. And thus "Asura" also stands as a caricature of Korean society which doesn't slowly introduce us to the social evils of the country like corruption, but clubs it into our heads with a sledgehammer. Of course the danger resulting from this is that the movie might seem over-the-top and become a caricature of itself. In the end, it's a proper amount of cynism which just manages to prevent this from happening. This very direct style and the nihilism located somewhere at the edge of what's still bearable are also what make this flick differ from seemingly similar works like "The King" or "Master". Jeong Woo-sung, also to be seen in "The King" or "Remember You", plays a man without a conscience who finds himself in the unlucky situation to be the pawn of two different sides. Han is already letting us know in the beginning that he simply choses the party that will end up being the winning team. Unfortunately, this time Han can only decide how big his loss will be. At the latest when he is beaten up by the prosecutors there is no doubt left in our mind that there is no good and evil in this world. And despite his strong moral shortcomings Han becomes a character to relate to since we eventually just have to start pitying him. 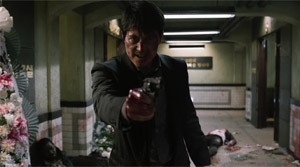 Hwang Jeong-min ("A Violent Prosecutor", "The Wailing") depicts the villain in a way that his deceitfulness in front of the photographers just makes us sick. He plays a politician who is more ruthless and cruel than any gangster you can imagine. It just takes a little bit until this becomes completely visible since he in fact also approaches things by thinking them through. However, when towards the showdown everything heads down a vortex of violence he in fact gets caricatural traits. 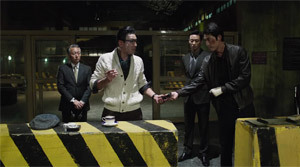 That the villain still remains interesting and multilayered is Hwang's achievement. 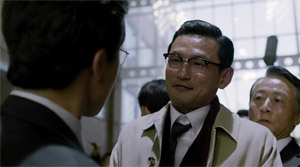 Individuals like the prosecutor played by Kwak Do-won ("The Shameless") give the story additional nuances of evil or at least not of anything that can be considered good. The movie particularly gets more color thanks to the cop's prot�g� played by Joo Ji-hoon ("Confession"), who because of the cop is heading for a career as a gangster. Despite its 133 minutes running time there is not a minute of boredom in "Asura". Little subplots are woven into the movie well and the dying wife of the cop is not used to give Han something like a heart after all. Yet, he actually seems more like a human being because of this wife. 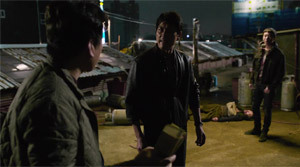 Director Kim Seong-su ("The Flu", "Musa") knows his craft and gives his movie more authenticity via some shaky cam during the more fast-paced scenes. Furthermore, the at times very appearant unpolished pictures make for an atmosphere of grittiness and violence. The action is at all times brutal and gets bloodier with every minute passing. Moreover, a car chasing scene perfectly depicts the madness that is constantly running wild in Annam, which ultimately culminates in a finale where the protagonists crawl through puddles of blood. That you shouldn't count on every single one of the protagonists managing to survive the showdown is something there is no doubt about in this fantastically gritty crime action movie. Because of its everything but subtle grittiness the movie is probably first and foremost strongly recommended to genre fans, though.